As the sun shines down on the island of Miaui (MEOW-ee), children gather at the beach to stare into the clear depths of the lagoon. Tigerfish, Tuna, and other fish dart in and out of the waves at their feet as the children laugh and try to catch them with their bare hands. Divers grab their gear and prepare to jump in, eager to catch the slippery fish for the evening’s feast. As the tides change, the lagoon is filled with fish, marking the start of the fishing festival! Outwit your opponents in this quick, hand management game that's fun for the whole family. 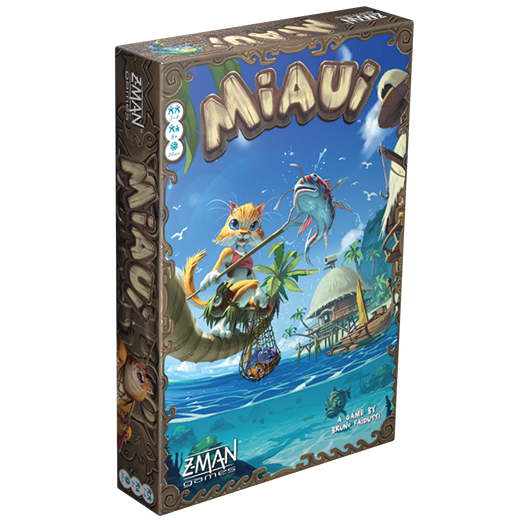 Miaui is available for pre-order now through our website or your local retailers. 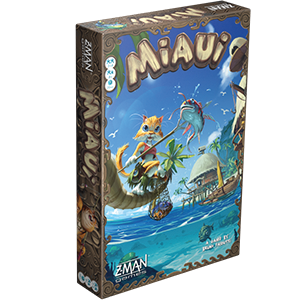 Travel to the island of Miaui for your next game night. The tide has filled the lagoon with fish, large and small, marking the beginning of the fishing festival! In Miaui, 3-6 players can dive into the depths for the biggest catch. Each player will have their choice of Miauian diver. You can choose the young kitten, the grandma cat, the big kahuna, and more! Each cat is ready to leap into the lagoon and catch the best fish to prove their skill. 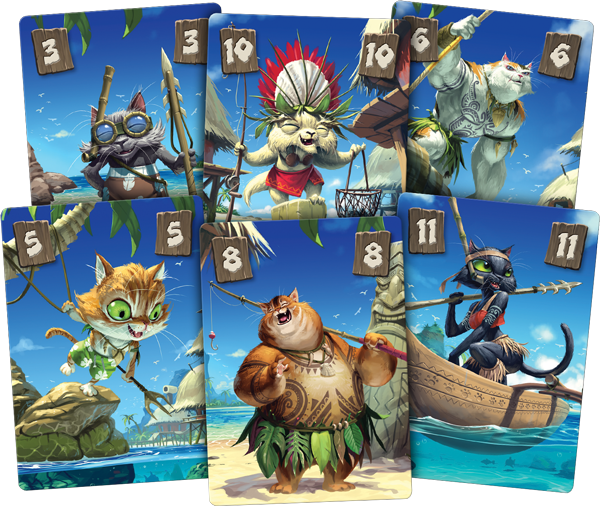 After selecting your Miauian diver, you will have a hand of cards numbered 1-12. Over 12 rounds, players will dive into the lagoon to catch fish from the shallow, deep, or deepest waters. 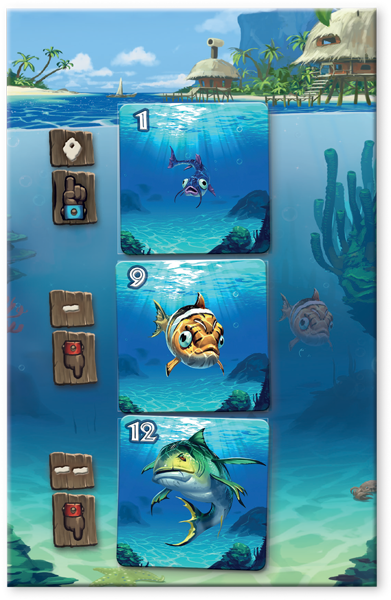 Each round you will play one card from your hand facedown, thinking carefully about which number to play to catch the fish you want. Playing a 1 indicates a shallow dive, while a 12 is the deepest dive you can do. Managing your hand and deducing what your opponents are playing will be the key to getting the best fish from the lagoon's depths. Each round the tide pulls in new fish, filling the lagoon. Starting with the bottom space and proceeding upward, draw the top card of the fish deck and place it faceup on the lagoon. 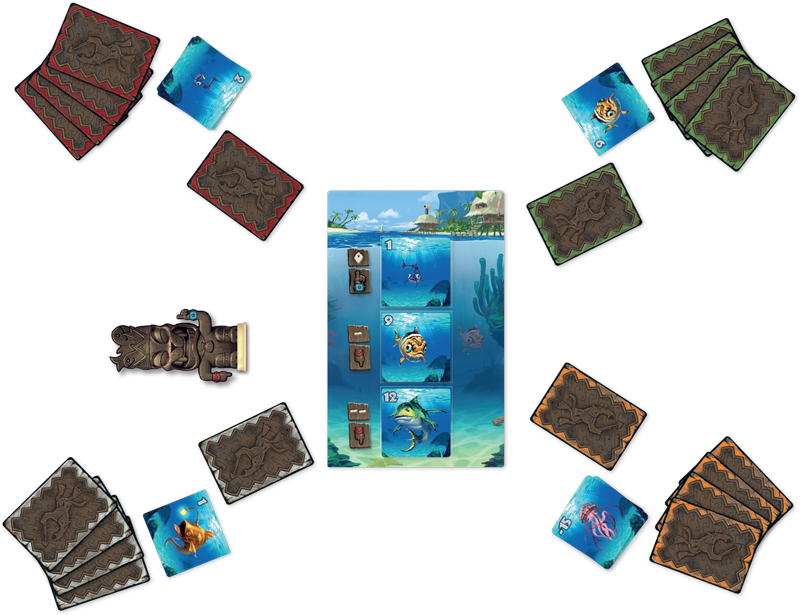 Now that the lagoon is full, each player will choose one diver card from their hand and place it facedown near the board. When everyone has chosen a card, all players flip their cards faceup to reveal how deep they chose to dive. Starting with the deepest space and proceeding upward, compare numbers on the revealed diver cards to resolve the three depths. If two or more diver cards tie for winning a catch, Kiti, the divine tiki, decides who is most deserving of the catch and breaks the tie. Kiti’s arm pointing downward and wearing the red bracelet breaks the deepest or deep depth ties. The tied player who is closest to Kiti in a counterclockwise direction wins the catch. The other arm pointing upward and wearing the blue bracelet breaks the shallow ties. The tied player closest to Kiti in a clockwise direction wins the catch. In the example below, player one (grandma cat), player two (kitten), and player three (big kahuna) have all played a 9. This is a tie for the deepest space in the lagoon so the tied player closest to Kiti’s right arm wins the Emperor Tuna and discards their diver card facedown. Now two diver cards show the highest number (grandma cat and the kitten both show 9). This is a tie for the deep space in the lagoon. The tied player closest to Kiti’s right arm (the kitten) wins the Tigerfish and discards their diver card facedown. The final two diver cards are compared, and a single diver card shows the lowest remaining number (grandpa cat’s 6). That player wins the Kittenfish, leaving grandma cat with an empty lagoon and no fish to catch this round. Kiti is then moved clockwise to the next space between players and a new round begins. Will you prove your skill and catch the most fish for the feast? Select your diver and get ready, Miaui will be $24.99 and release in early 2019. Pre-order your copy today!